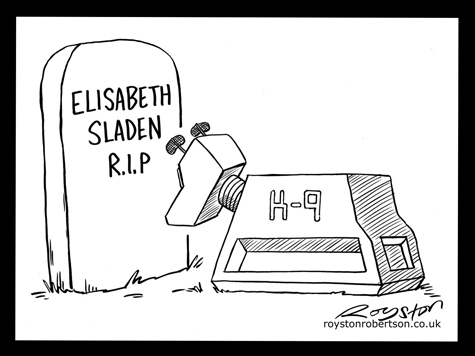 This cartoon was intended as a genuine tribute to the actress Elisabeth Sladen, who died last week, rather than an exercise in humour. It appears in the current Private Eye. I think I got the balance right -- it is intended to be moving without being too sentimental -- as I've had a positive reaction to it. Since I drew it, I've seen similar cartoons on the web. This is inevitable with topical cartoons. Any cartoonist who sat down to think about this subject may well have thought of K-9, who was inextricably linked to Sarah Jane, Sladen's Doctor Who character. And as death is the subject it's a short logical leap to a Greyfriars Bobby scenario. Topical cartoons are drawn quickly and sometimes mistakes are made. There is one in this cartoon. I'll give points to any Doctor Who fan, or anyone else, who spots it! Comment below if you know. Max points, Isle, but all deducted again for no hyphen in K-9. Sorry about that. Pendantic? Oh wait, I see what you did there. Is that K-9 Mk1, 2 or 3 Royston? That last comment was from me - Cathy forgot to sign out again! Most obvious: There is no period after the P in "R.I.P."